Simon & Schuster Books for Young Readers, 9781534420502, 400pp. From the author of Tash Hearts Tolstoy comes a funny, moving novel about the lengths we’ll go to make dreams our dreams come true that’s perfect for fans of Shaun David Hutchinson and Rainbow Rowell. Slater, Kansas, is a small town where not much seems to happen. Stella dreams of being a space engineer. After Stella’s mom dies by suicide and her brother runs off to Red Sun, the local hippie commune, Stella is forced to bring her dreams down to earth to care for her sister, Jill. The day Stella and Galliard meet, there is something in the air in their small town. Literally. So begin weeks of pink lightning, bloodred rain, unexplained storms...And a countdown clock appears mysteriously above the town hall. With time ticking down to some great unknowable end they’ll each have to make a choice. If this is really the end of the world, who do they want to be when they face it? Kathryn Ormsbee grew up with a secret garden in her backyard and a spaceship in her basement. She is the author of The Water and the Wild and the YA novels Lucky Few and Tash Hearts Tolstoy. She’s lived in lots of fascinating cities, from Birmingham to London to Seville, but she currently lives in Austin, Texas. 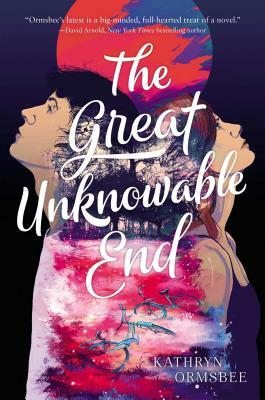 "THE GREAT UNKNOWABLE END is unlike any book I’ve read. Take a small-town paranormal mystery, drop in a 70s commune, add a dash of haunting familial histories, and a hefty scoop of Science vs. Art, and voila: a book to delight the likes of Carl Sagan himself. Ormsbee’s latest is a big-minded, full-hearted treat of a novel." It’s a rare author who can imagine a story like this. It’s a rarer author with the ambition to try it. And it’s the rarest of all who can execute it in such lyrical, haunting beauty. Kathryn Ormsbee is that author. Breathtakingly imaginative and ambitious; dazzlingly beautiful and profound. This story of love and fervor will grip you and won’t let go. Not even after you’ve finished. A hauntingly beautiful and wildly imaginative story of faith, fervor, coming of age, and connection. Masterfully rendered and spellbinding." "Fantastic premise meets perfect execution in this heartfelt and wholly original novel." "A mesmerizing, trippy, and fantastic story about finding yourself in the most extraordinary circumstances in the most ordinary of places. Ormsbee has written a coming-of-age novel like no other." "Realism with a hint of science fiction will inspire readers to question their own trajectories." "Told in alternating perspectives by Stella and Galliard, Ormsbee (Tash Hearts Tolstoy) skillfully parallels nature’s disturbances with her characters’ internal turmoil to create a suspenseful story about self-discovery and following one’s dreams amid a life’s complications"